Orbit One has developed a unique solution that allows you to track and analyse “unhandled exceptions” in the code of web applications. “Unhandled exceptions” are problems that are not supposed to happen. No system is perfect and environmental changes as well as different types of clients devices (browsers) can result in small issues. You can make a friendly error page that explains the user an issue has happened, and invite him to try his action again. If the problem remains, the user can click on a link and send an email to your support. This email contains the unique reference number of the issue. Your development team can monitor and fix the issues as soon as possible. All issues are centralized in a database, allowing your team to quickly find detailed information about the problem. This unique solution allows you to be efficient and provide high quality web applications. You can find more information, the code, documentation and ready to use installers on Codeplex. When importing data in Dynamics CRM 4.0 there is no client side code triggered, so to make sure you get phonenumbers (or anything else for that matter) in a clean format, you might want to consider creating a plugin that runs server side and generates an import failure to let the customer know some data is not valid in his imports. This way the user knows when something went wrong and the correct data will still be imported. To make this plugin work there is the issue of the country prefixes and areacodes that exist. Therefore it is necessary to create two new entities: Country and AreaCode. Ones this data is in CRM we can use it in our plugin through the webservice. In the end the phonenumbers will be formatted in an outlook compatible format. When using the installer inside the project on CodePlex the plugin will be registered for the create and update messages for lead, account and contact. 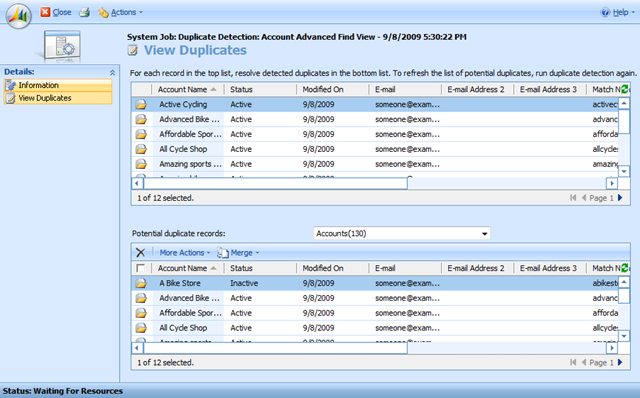 These exceptions will never be caught by the default CRM Duplicate detection. to lower case and trim. replace special characters (except parenthesis, a-z, 0-9, special characters like éèàç …, and spaces) with empty string. remove everything between the parentheses eg: "HP (was Compaq)" becomes "HP"
Next there need to be some new duplicate detection rules. Once the job ran, you can see the duplicates entries. You can find the Matchname plugin on CodePlex. There is an installer include so that you don’t need to worry about the plugin registration, creating the steps, …. More on this on CodePlex. We needed a drop down box in our CRM 4.0 environments for a lot of our clients. The data from the drop down should come from within CRM 4.0 to limit the dependencies to other systems. How does it stick together? Finally we needed to write some plumbing code to make it work. As for the creation of the ISVspecific.js script I would like to link to a previous post a wrote on Client-side validation scripts. In that post you can see a way to create a script paste it in CRM without changing code in the events of every field on every form. The GetCountries which is assigned to getDataCallback is where the CRM service queries are performed. This should be your own implementation. I have prepared some sample code that retrieves countries from a small custom entity called new_country with the attributes new_countryid and new_name. As you can see in the above code block, the function takes one parameter, being the part you typed in the field you need the autocomplete functionality on. Then some fetch xml is generated by the crmHelper objects and the query is executed. This will only get 20 records as specified in the line crmService.Fetch(20). The crmHelpers.js contains a method called CrmService.prototype.Fetch, which is a reworked version of the CrmService.prototype.RetreiveMultiple from the code of Andrew Zimmer. You can download a complete sample but don’t forget to create the new_country entity if you want to test. Preserve and created and modified information when importing a document in SharePoint. I’m currently writing a web service on our SharePoint server to upload documents because one of our clients would like to migrate from a third party document management system to SharePoint. This client would like to keep the legacy dates like the date of creation and the last modified date. After researching this, I still couldn’t find a way to do this. I noticed there are tools out there are able to do this so it is definitely possible. So after some more trial and error I finally figured it out. And it wasn’t even that exotic, so I’d like to share how it is done. //When you do overwritecheckin the version doesn't change. MailChimp Sync Module makes it easier for developers to synchronize their lists from any datasource to mailchimp. It’s developed in C# on the mailchimp .NET wrapper. Thank you, MailChimp, for the link on your blog. One of our customers recently asked to do an update on their instance of the microsoft CRM 4.0 platform. The goal was to change the current Country Picklist to a lookup field which points to a new_country entity. The new_country entity contains a few translations of the countries in different languages like english, dutch and french, and the ISO codes for each country. This tool allows you to export data generated by an advanced find view to a CSV file which you can later on import in CRM 4.0 trhough an update job. So I started playing around with it. The major issue for me is that with that tool I couldn’t get the lookup field to be populated. I tried a bunch of different things like “account,E52B43A8-5FC6-4934-A5A3-96B2983EE140” or just the “E52B43A8-5FC6-4934-A5A3-96B2983EE140” but nothing seemed to work. So I decided to create a new tool that basically does what i want, without creating an import job. Everything is done through the CRM SDK. You can save your connection. We are a hosting company and we have 6 different CRM instances on 3 different servers, so this is quite nice. One of our clients has 15.000+ records in their contacts. Because CRM returns only 5.000 records for each request, I can’t update them all in one go. This was changed by making multiple requests if necessary. Access all the records and all the fields. In the MSCRM 4.0 Bulk Data Export Tool you can only use the tool on Advanced find views. I allow you to use the tool on the main entity. Which is really helpfull in some cases. It is still a work in progress but it does the job quite nice already so try it out. Creating a simple Microsoft CRM 4.0 plugin. Ok, in the beginning there was nothing. So, let’s start by taking a look at Introduction to Plug-in Development for Microsoft Dynamics CRM 4.0. From here we can copy paste some sample code into a new class library. // some other useful work. As you notice when you paste the above code, you’ll get missing an assembly reference errors. If you haven’t already installed the Microsoft Dynamics CRM 4.0 Sdk , please do so now. How do we get the assembly in CRM ??? Make sure the user with which you want to register the plugin in CRM has the proper roles: either the System Administrator role or the System Customizer role are needed. Make sure the user is a Deployment Administrator in the Deployment Manager. Download the Plugin Registration tool. Run the tool on the server of on a location from where you can connect through AD authentication type (active directory) because otherwise it wont work. Now you should see the Plugin registration tool. Enter your connection information in the fields below. In Discovery server you can just type your servername. You’ll be prompted for a password when you hit the Connect button. Once you entered your password, you should see one or more CRM instances in the tree. Hit the organisation you want to register the plugin in and click on the connect button. Click on the register button and select the Register new assembly. Now press the ellips button (…) to browse to your assembly and choose the location you want the assembly to be stored. I recommend you use the Database as your assembly storage. The reason for this recommendation is quite simple: if you choose another method you’ll manually have to deploy your assembly after adding or updating. Next select the register selected plugin’s button. You should now see our newly registered assembly in the list. If you click on the + sign in the registered Plugins & … tree you’ll see the HelloWorld plugin. Right click that and select register new step. A little commenting trick to switch between code blocks to use. If you want to test a windows service for instance, you can’t start it in the debugger. But I want to use the debugger. Then you could write something like the code below in the Program.cs. Insert an internal Start method in the service code that just calls the OnStart() method of your service. Now for the magic… i can now easily switch the code blocks (first 2 lines and last 5 lines) by removing one of the first 2 asterix (*) or reinserting one.